Hi all!! Back again with another project, this one that has a little bit of everything in it - quilling, ribbonry, sewing, beading, porcelain doll! I have had this ready but not photographed because are whole family has been down with what I call the "creeping crud". One of those bad head colds that zap the life out of you. I have been counting the days now for a week to look forward to feeling better, but that hasn't happened yet! Last weekend my DH took me to the International Quilt Show here in Houston and sweetly walked around while I looked at the vendors and the quilt displays, never huffing, never looking at his watch. He's a keeper! One of my favorite booths is the Helen Gibbs Ribbonry booth. She had the most beautiful projects for ribbon, stunning flowers that can be made into all sorts of feminine frillery! I think I have almost all of her books and while I have made some of the projects I just love to look at the pictures!! I have in the past tried my hand a porcelain doll making and have created porcelain dolls from greenware to dressed and have loved the whole process. The studio that I was taking classes from closed and I never found another to continue, so my supplies were put away for another time. While at Helen's booth, she had for sale a kits to make vintage porcelain half doll pincushions. These vintage beauties were all the rage back in the day and women decorated the "skirt" pincushion portion of their bodies with silks, lace, ribbon flowers and beading. They were used to create tassels, tops to powder puffs and to hide anything on the dresser that was "unmentionable" in polite society. There are lots of picture on the net of them and I love to look at them for inspiration. My mind immediately went to "I can add quilled flowers in the mix and it would be stunning!" After I assembled the bottom pincushion from the dupioni silk and attached the flapper doll half body. Then I added her two layer lace over skirt and started to embellish it with an assortment of ribbon flowers and beading. The kit came with a few flowers but the majority of these were made just for her. I quilled white six petal flowers with aurora crystal centers, buds and leaves to add amongst the ribbon and lace. The quilled flowers were held in place by the same thread that I used for attaching the ribbon flowers. I just set them in the design and came up with my threaded needle close to the center of the quilled flower and then down through the adjoining petal. If you look close with the picture enlarged you will be able to see the thread, but not when viewing it from a normal range. The buds were glued in as they were a bit tricky to get them to sit the way I wanted them to. I have used fabric glue before to glue the quilled flowers on the Ring Bearer Pillow with success. There are many antique half dolls for sale on ebay and other places on the net, but Helen has a source that recreates them for her. The reproductions come in a wide rage of ladies, dressed in all sorts of historical costumes to ones that are more modern in dress, as well as a wide range of poses, colors. I would love to try my hand at porcelain painting again and have found another studio that pours the doll bodies! Unfortunately the studio is about 45 minutes away and I don't know how often that I will get to go for classes, but, I can get the blanks done and fired to paint and fire the painting with my own kiln. It takes several firings to get the greenware to a point where you can paint the features and each layer of painting takes another. This doll body is beautifully done by the artist that created her. This lady has become an heirloom for one of the grand daughters, but since I have two DGD's I will need another and I have a design in my head for another with all quilled embellishments! 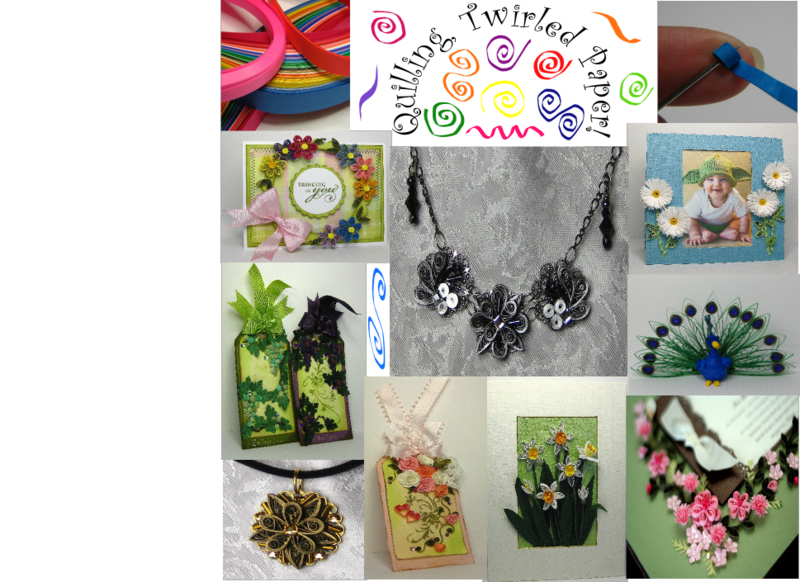 My online quilling class Quilling, Twirled Paper! is being offered again by My Creative Classroom. It is six weeks starting November 26, 2012 with a two week break for the holidays, starting again Jan 7, 2013 with the final two lessons. The class covers beginning quilling and moves onto intermediate quilling techniques. There are projects each week to create to show off your quilling skills, a forum to chat with me and your fellow students and a gallery to post your projects if you like! You can view the lessons at your leisure when ever you like and with the MCC Extended Enrollment you will have access to all the class materials even after the classroom closes. And, if you enroll for any class in November you will get the "It's Ornamental" class free! To see the class description, supply list and optional kit, click on the banner above or here. Thanks for visiting and all the sweet encouragement that you leave in the comments. Feel free to email me if you have any questions! Hi everyone! I'm back, did you think I fell off the earth? I took a little sabbatical from blogging because of things in life that took my focus away from posting here. My creative endeavors where not totally silent though as I have added a new class to My Creative Classroom - Quilled Floral Calendar - and it will run again, after the first of the year along with my other class - Quilling, Twirled Paper! I have some other class possibilities that I am playing around with and may have them ready also for next year. I do appreciate greatly those who visited during my absence and left sweet comments and encouragement! And, after this very long away time from my blog I do have a card to post. A friend is going through some difficult times and I wanted to make her a card to encourage her. It is a floral punched easel card. Click on any picture to enlarge. I decided on a 6" x 6" easel card that could be displayed so that the sentiment could be seen often. The scalloped edge of the Martha Stewart lattice punch was folded up to hold the easel in place. I love these hydrangea flowers and my friend's house is decorated with these colors. It is also a nice color scheme for fall as well. I used several colors of copper, deep oranges, red oranges and olive green Twinkling H2O's to paint my punched coffee filter paper hydrangea petals. Their subtle shimmer is so pretty! I added some punched gold vellum accent flowers with gold pearl centers and an ombre bow that picks up the rusty color in the flowers. The inside of the card is also decorated and is where I will write my message to her. When the card is in the easel position, you will not be able to see the message. When not in the easel position the card will lay flat (not completely because I used the dimensional bow and flowers, but will if you do not use these on the inside) onto the base and is 6" x 6". The top bends between the two top panels and allows the front to flip to be able to be positioned in an easel. I will make a card box to fit it to send it to her. I also want to send my thoughts and prayers out to all who were affected by the hurricane in the NE. So many were not prepared for it and are having a hard time dealing with the aftermath. I have family and friends who were in it's path and I am praying for their quick recovery and safety! I hope you will visit again, as I am back to creating and posting projects! If you have any questions just let me know! I love to hear from you! for My Creative Classroom is open for registration and will be starting soon - March 2, 2012! You can register and start after the 1st day of class for a short time. 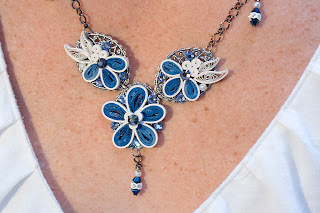 The online class covers the basics of quilling as well as more advanced techniques. The class is six weeks, one new lesson each week, view at your leisure, and has lots of projects for you practice and show off your new quilling skills. If you would like to learn how to quill and make your own quilled projects, click on the links above to see the full class description, supply list and registration link. I'd love to see you there! Now on to the project above. You can click on pictures for larger view. We don't get snow here on the Gulf Coast very often so I usually have to make my own snowflakes if I want to see them. I used a hurricane candle cover and set it onto a glass dessert plate filled with glass pebbles in shades of blue and white and glittered punched snowflakes. Inside the candle cover is a small candle votive. I wrapped a wide blue satin wire edge ribbon around the hurricane cover using double sided tape and attached a separate bow to the front. The bow was the perfect place to show off a quilled snowflake that is embellished with clear crystals and pearls. Two smaller snowflakes dangle from it. Along the ribbon I put smaller snowflakes and snowflake flowers made from shimmery pearly strips. 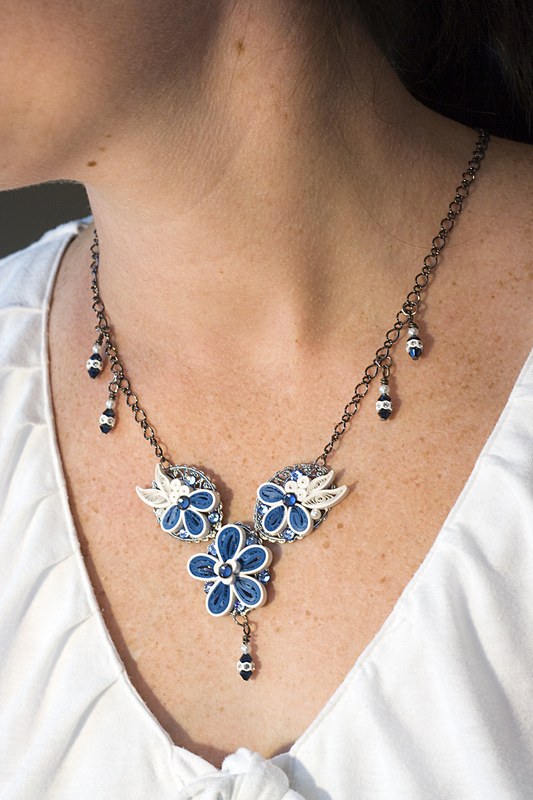 The two layer snowflake flowers were made with 6 blue eccentric marquise with white V scrolls between them. Then a smaller 6 marquise white layer added on top. For the other version, I used blue V scrolls between the white layer. Add a pearl or crystal to the center. This would be pretty in any color combination! If you make a project with these versatile flowers, post a link in the comments section to share! Due to increasing spam in my contact email, please put a specific post reference in the subject line if you have a question or request. If it is general, just reference the most recent post. Sorry to have to ask you to go to that trouble but spammers are getting increasingly clever at the subject lines of their posts and I cannot afford to click on one that may be infected!! If you have sent me an email asking a questions lately, PLEASE resend it again!! Thank you for all your sweet comments. Wow, it amazes me how time flies! The last few months of last year were really busy, taxing and just plain crazy. And, while I had projects for Custom Quilling (this is one of them), I did not post them. I want to thank all who follow my blog and apologize for not attending to posting and I DO appreciate you stopping by to visit my projects!!!! Sometimes it is hard to "get back into it" as they say after an absence. So I will catch up on the projects not posted and then start with fresh ones for this year! I have been lurking around the web and have seen some amazing quilled projects from all over the world. Quilling is really coming into it's own with some unique styles from this new generation of quillers! While browsing some those world wide quilling sites I found this little flower that is called a Malaysian Flower. So called for the Malaysian quillers who created it and use it in some beautiful projects!!!! Here is a link to the flower tutorial (scroll down to find it). I decided to use it in a necklace and this time not gild the edges with metallic paint. I loved the blue and white color pearly papers and I think it makes a striking statement. Click on pictures to see larger view. I wish I could capture the sparklyness (I know that isn't a word lol!!) of the crystals and dangles. Even the flowers shimmer from the pearly papers. These flowers are easy and fun to make and I know I will be using them often as they are lovely in any color combination. is being offered again and is open for enrollment now here. Classes start March 2, 2012 but you can start after the official first day of class. You can see a description of the class, a supply list and kits on the link above. I am looking forward to the new class and hope to see some of you there! If you have any questions please email me! More posts to post in the coming days, so check back soon! Thanks for all the comments that everyone left for me in my absence!! Hi everyone! I have neglected my poor little blog and will be posting about the same amount for a couple of more weeks. I am working on the classes for my online quilling class for My Creative Classroom and there are two more weeks to go. So after that I should be back to posting regularly : ) ! I do have a post for today though and at the first of each month I have projects that I have created for the Custom Quilling Newsletter. The kit for October had beautiful fall colors in it and I couldn't resist making another jewelry piece. 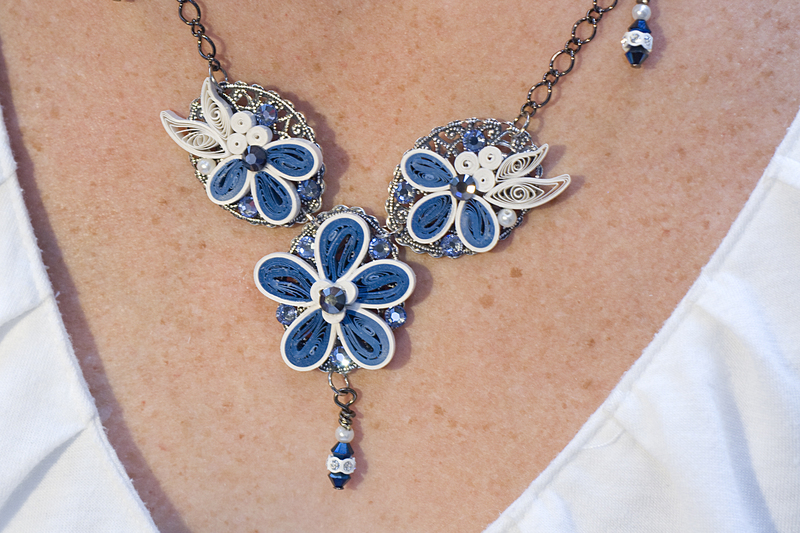 I used oval filigree jewelry pieces as my base for the quilled leaves. Each quilled gold gilded leaf gives a flash of fall color when seen from the side. 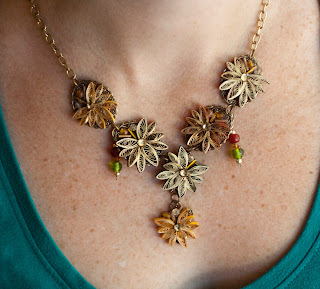 The leaves are "falling" down the necklace to the last one that dangles. Fall color beads dangle amongst the leaves while beads and crystals give it sparkle. I am very ready for fall and we are just now getting some milder temperatures here in Texas, although not any rain! This is my first online class and I have been enjoying it and the students so much, and they are doing so well!!! Some of the students have quilling experience and others are just trying it out for the first time. They are very creative and their projects are wonderful! I still have two projects from the newsletter that I have ready to post and I will get them up later. Thanks to all who visit and leave such nice encouraging notes! See y'all later! Hi all, I have another project to share using the new technique, curled loops (tutorial here). I love pretty glass and when I saw this red one I new that I had to make a project with it. I used the decorative paper and strips from the August Custom Quilling kit to make the embellishments. Simple 6 petal flowers are accented with curled looped flowers upon the bottle "label" that wraps around the middle of the bottle. This time I didn't encircle the loops and curled them for a fan like shape. I really like this technique it has soo many possibilities. I added a bit of the same to the neck of the bottle along with a tassel. Try this new technique and post your picture links in the comments! I have put a link to my online quilling class with My Creative Classroom, Quilling, Twirled Paper! on the sidebar. Registration is now open and the class starts September 15, 2011. You can register after the class opens and you have access to the class lessons, gallery until December to finish up. If you have any questions about the class or projects, just email me at appelquillinggarden@yahoo.com . Another project tomorrow. Hi all, I have neglected my poor little blog but have been working hard behind the scenes getting my online quilling class for My Creative Classroom ready for registration. It is now finished and I am excited that I can now reveal the link to the class. But first the project above that I made for the Custom Quilling Newsletter this month. I used a purchased letter holder and added the quilled embellishments. The technique that I used for the center flower was from this blog and it uses looped flowers in a new and very pretty way. Asma has a great tutorial on how to create them plus many wonderful projects using them! Stop by and visit her blog you will love her projects. I know I will be using this technique again. Now for the quilling class, it is named Quilling, Twirled Paper! It will cover the basics, intermediate and some advanced quilling techniques and will be 6 weeks long. There will be a class project(s) each week with week's 5 is a quilled keepsake such as I feature here on my blog. 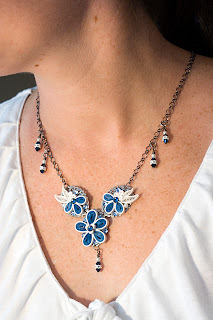 Week 6's project is a quilled necklace that used the technique that combines jewelry pieces and quilling such as this one. You can visit My Creative Classroom Quilling, Twirled Paper! class site here to see the full description, cost, and supply list (which Denise at Custom Quilling has a copy of and can help in ordering any supplies, Thanks Denise!). If you have any questions about the class, just email me at appelquillinggarden@yahoo.com and I will be glad to answer. There are also many other wonderful papercrafting classes offered this fall through MCC. I should be back to creating on a regular basis now that the class is up for registration. I will be back tomorrow with more projects! Thanks for all the comments, I have and do read them all.